I'm going on a trip in a few weeks and would like to leave my laptop at home. This is a test post using only my iPhone to take a photo of a painting, crop it, and post it to my blog. 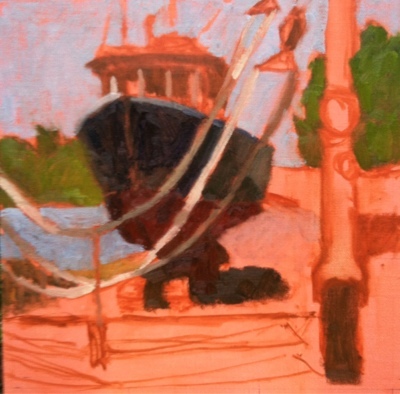 I started this painting on Monday at the Royal River Boat Yard. I couldn't resist the pattern of the travel lift straps across the front of the Irish Piper, sitting on jack stands (not yet in the painting). What do you think, does this method work? PS - The hardest part was getting all of the image. Be sure to use the image settings in the blogger iPhone app to do that, no need to resize the image beforehand.